Episode Review: LEVERAGE, "The Last Dam Job"
While watching "The Last Dam Job," I thought to myself that it could have been a pretty decent series finale. Thankfully, we're in store for another season of Leverage, but I wouldn't have been upset if this had been the last episode ever. Sure, it wasn't transcendent (but I've kind of given up on Leverage ever being a truly risk-taking show), but it was fun enough with some characters getting some closure. Last week, we learned that Victor Dubenich was the man behind the curtain and was the one feeding Latimer information on the companies that the Leverage Crew took down. Since Dubenich put the team together, he knew all of their tricks which made getting back at him and Latimer challenging, so our favorite grifters had to recruit some outside help in the form of Quinn, Archie, Chaos and Maggie. The job revolved around sabotaging an important dam that Latimer had the rights to while also besmirching his public name. While the Crew publicly and financially ruined Latimer, Nate had other plans and wanted revenge for his dead father. After a one-side Mexican standoff, Nate decided that killing Dubenich and Latimer was not the answer, so he let them kill each other off. The con itself was pretty straightforward and nothing we haven't seen before. The Crew stole valuable items, drugged people and framed them for insider trading. All in a days work, but what made "The Last Dam Job" so enjoyable was the B-team that was assembled since they all had ties to our "heroes." Obviously, watching Hardison and Chaos bicker was a highlight, but I was a big fan of Archie's so having him back was a nice touch. I was also pleasantly surprised that they brought Maggie back since she's been one of my favorite supporting characters since the show's early days. Quinn and Eliot were the only misfire, but it did look like Hardison had some competition to be Eliot's bromantic partner. Narratively speaking, the element that did not work as well as the others was Nate's quest for revenge. Now, it was a logical place for him to go after seeing his father get blown up, but I wasn't quite buying Timothy Hutton's performance, and it all felt stagey. That final scene between him and the two baddies where they tried to convince him to kill the other guy was poorly scripted, and it kind of brought the rest of the episode down around it. Again, I know why it had to happen, but I just wish the execution was better. The best part of Nate's story by far was when Eliot told him how killing a man changes you, and how everyday he's trying to find the young man he used to be. It's those quieter moments between the Crew that makes this show special, and I was glad Eliot was the one to talk sense into Nate. Leave it to Hardison to hack someone with a clam. Eliot's speech to Nate was Christian Kane at his finest. We need more Eliot moments like that. We definitely need more Tombstone references in our world. You really can't blame Maggie. There's something about Sterling. That scene between Nate, Dubenich and Latimer was kind of silly. What was even worse was having the two bad guys fall over a cliff. Ah well. "He upped the crazy. I didn't think he could do it." Archie: "This ... this is my daughter?" Parker: "See you later, sis." "No, you got me a Batcave!" Quinn: "Can I hit him?" Eliot: "See, it's not just me." "Wow, this must be how Eliot feels. I just realized this is how he feels all the time. You just want to hit something." "So, you can trust me when I tell you, you pull that trigger and two men die. The guy you kill and the guy you used to be." Sophie: "What are you doing?" Eliot: "I'm thinking of saving my friend some trouble." Quinn: "Hell, next time give me the gun. I'm your huckleberry. Quinn: "A little late now." Eliot: "I love that movie." Quinn: "Who the hell doesn't?" The end of Season 4 was not a momentous occasion. 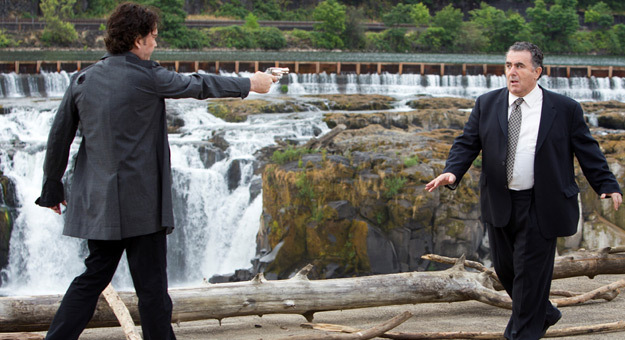 "The Last Dam Job" right in Leverage's wheelhouse which wasn't necessarily a bad thing. It was safe, familiar and entertaining. It's just too bad that it didn't try to be more. Don't get me wrong, I love that Leverage knows what it's good and is consistent, but straying from the formula doesn't hurt either. True, Season 4 did color outside of the lines a few times, but serialized elements could take this show to the next level. Just something to think about.